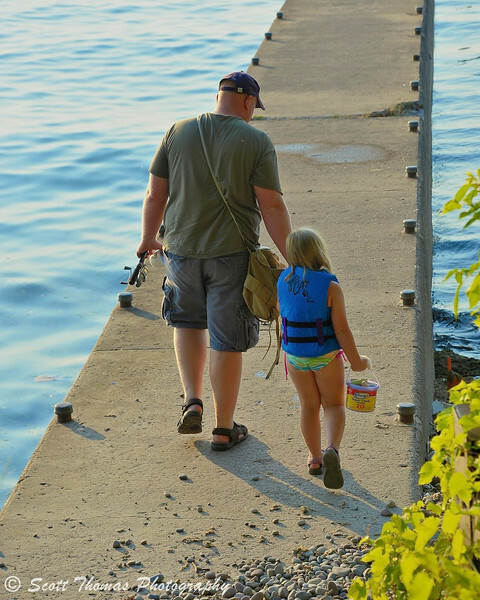 While walking around Fair Haven State Park last weekend, I followed a Dad taking his daughter fishing with him. They were so cute together as they walked out onto the old pier. He had his fishing gear and she had a bucket of colored chalk to play with. They talked as he started to fish and she began coloring the weathered cement. Brightening both their lives. This entry was posted in People and tagged 28-300mm, cement, dad, daughter, family, father, fishing, girl, great lakes, Lake Ontario, love, man, new york, nikon D700, pier, time, trace adkins, vr, water. Bookmark the permalink. So sweet! Makes me nostalgic for the days when my girls were of the sidewalk chalk age! Me, too. Though I enjoy the fine young women they have both become. They are still my little girls. And you know how to brighten up our blog-walking moments. Thank you for the fine compliment. Your scale post did the same for me today. Tht is a great capture Scott! A photo is indeed worth a thousand words!